Pre-sale for this event has ended. You can purchase tickets at the box office tonight starting at 930pm. Early arrival is strongly suggested as tickets are limited. Table service is also available, please email VIP@avalonhollywood.com to reserve. 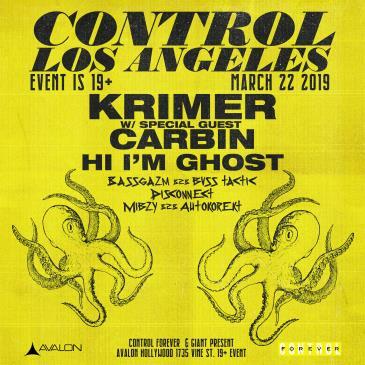 On March 22nd, AVALON Hollywood is pleased to welcome Canadian dubstep producer Krimer for this edition of CONTROL Friday, with support from Carbin, Hi I’m Ghost, Bassgazm b2b Bvss Tactic, Disconnect, and Mibzy! As part of the bass-heavy Never Say Die record label, Krimer brings the heat with his boundary-breaking dubstep sound. He’s known for taking aspects of other genres and seamlessly combining them. He’s even gained support within the dubstep community from artists such as Excision, Borgore, Spag Heddy, and Getter. Krimer’s stage presence in addition to his artfully-mastered productions are sure to make for a great show. Supporting Krimer will be Carbin and Hi I’m Ghost, along with some local talent Bassgazm b2b Bvss Tactic, Disconnect, and Mibzy. Carbin’s releases have quickly caught the attention of influential bass-music producers such as Snails, Adventure Club, and Excision. He’s been featured on highly successful tracks such as “Boss” with AFK and Cody Ray and has remixed trap-heavy Flosstradamus’ “2 MUCH” by adding his own dub-influenced flair. Los Angeles-based duo Hi I’m Ghost are the perfect balance of fun, fast-paced dub tracks and heavily authentic riddim. They are on the road to immense success with each and every release. Their dark, heavy dubstep sound has gained the support of artists Dirtyphonics, Krewella, and R3HAB. Los Angeles locals Bassgazm, Bvss Tactic, Disconnect, and Mibzy will provide support and extra heavy bass tunes for the night. They’re all up and coming producers who are navigating their way through the always-growing bass music scene. Check out their mixes and original tracks on their SoundCloud pages below! Don’t miss out on this night full of some of the best talent the bass genre has to offer. 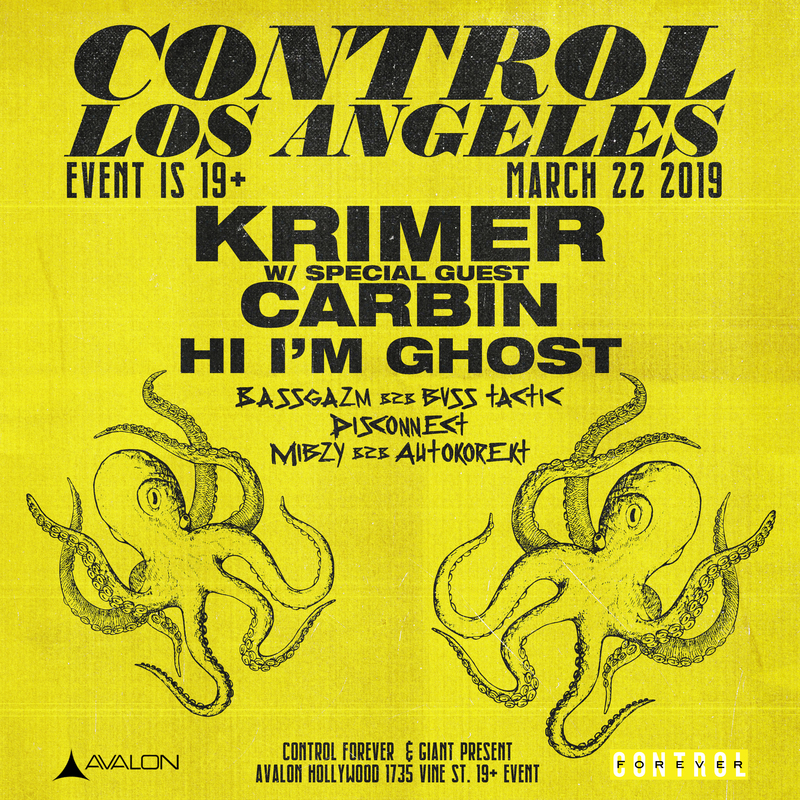 Grab your tickets for this edition of CONTROL Friday on March 22nd with Krimer, Carbin, Hi I’m Ghost, Bassgazm b2b Bvss Tactic, Disconnect, and Mibzy!